The Dodd Center is partnering with human rights organizations to offer training to pre-service and in-service teachers in human rights curricula, theories, and methods. Workshops are full-day, free of charge, and open to enrollment by teachers of all grades and content areas. Workshop examples and tools will be most appropriate to Language Arts and Social Studies teachers at the middle and high school level. 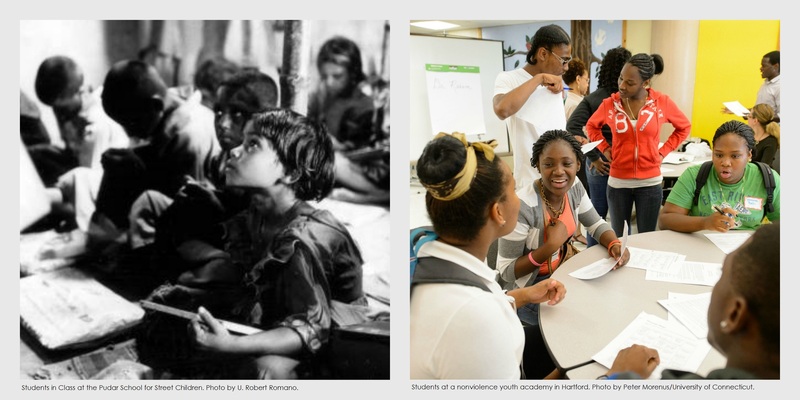 The Thomas J. Dodd Research Center is working to make Connecticut a national model for human rights education in primary and secondary schools. Taking international standards, including the UN Universal Declaration of Human Rights (1948) and UN Declaration on Human Rights Education and Training (2011), as its inspiration and basis, the Dodd Center aims not only at integrating human rights content into classroom curricula, but also at promoting a culture of human rights in our schools, our communities, and around the world. Using the materials of the Dodd Center Archives and Special Collections, together with talents and experiences of school and university faculty and staff, these lessons are designed to place appropriate human rights materials in the hands of teachers and students at the secondary level. This database offers college-level teachers the resources for teaching human rights topics in their class rooms from a range of disciplines and perspectives, enhancing interdisciplinarity and a broader understanding of human rights.